My husband accidentally bought an extra bag of carrots yesterday. So I decided to make this Carrot Ginger Juice. I will also be making a batch of my carrot cake breakfast cookies and carrot cake energy bites. They freeze well, so I will be saving them for my husband’s lunches. 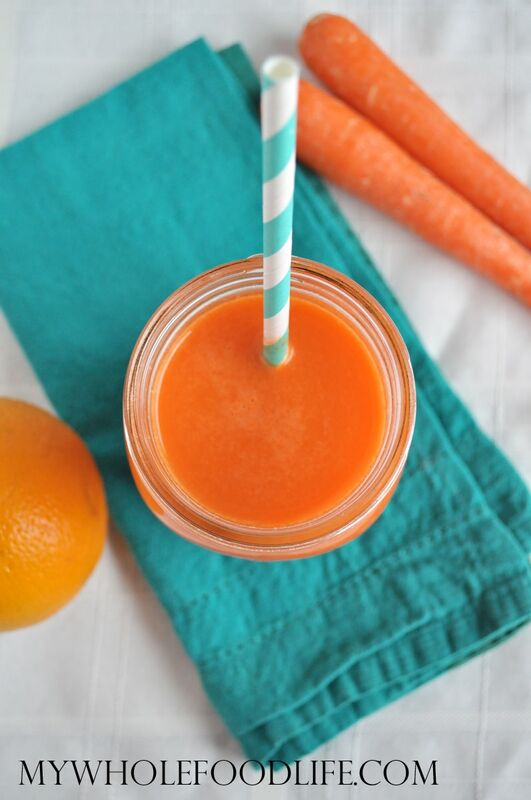 This carrot ginger juice is a great way to sneak some veggies into your kids. I think this juice would also make great popsicles. I like these molds for popsicles. An easy, kid friendly, juice recipe! Using a juicer , juice all 3 ingredients. Drink immediately. The juice will probably be good for about 24 hours. After that, some of the nutrients may be lost. If you are freezing the juice for popsicles, do so right away to preserve the nutrients. I keep the skins on the carrots. If you prefer to peel them you can. The rind of the orange can be juiced as well. I personally think it's too bitter, so I remove it. I save the rinds for when I have a recipe that calls for zest. Enjoy! What is the receipe for your cookies? Those pictures are so pretty I could cry... truly. I'm seven months pregnant, so tear triggers are everywhere. It makes me feel so healthy and hydrated just looking at that juice, and the orange color with the teal napkins is so gorgeous! Love it!